Webster University campuses across the network celebrated Veterans Day on Friday, Nov. 11, to join the national recognition of those who have served in our armed forces. The University also recognizes friends around the world who celebrate Remembrance Day, which likewise honors those who have served their countries. These holidays on Nov. 11 were originally conceived to celebrate peaceful relations among nations on the anniversary of the armistice ending World War I. 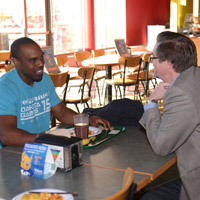 At the home campus in St. Louis, where Webster was founded in 1915, Webster's Student Veterans Organization (SVO) hosted the fifth annual Military Appreciation Breakfast in Marletto’s Marketplace, welcoming students, faculty and staff who are veterans or active military members. In St. Louis, the Student Veterans Organization hosted the fifth annual Military Appreciation Breakfast, welcoming students, faculty and staff who are veterans or active military. 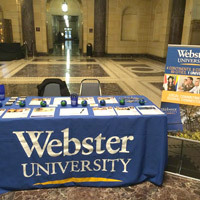 Similar events are held at Webster campuses across the United States. Webster campus locations in the National Capital Region (NCR) participated in several events throughout the week honoring current and former servicemen and servicewomen. Four of the five locations in the NCR region in Maryland and Virginia are on military bases. On Tuesday, the Webster NCR marketing director attended a special Veterans Day event hosted by the U.S. Department of Commerce. The keynote speaker was Kirk Bauer, who is the executive director and CEO of Disabled Sports USA. Bauer is an Army veteran and the recipient of two Bronze Stars and the Purple Heart. After Bauer's remarks, attendees met with representatives from the Department of Veterans Affairs, professional veteran organizations, and local universities including Webster. Staff at Webster's Fort Belvoir campus location held an open house for all the Veterans enrolled at Webster on Wednesday, Nov. 9. Dubbed “Muffins for Members,” students were encouraged to drop by the Webster office at Fort Belvoir to enjoy tasty treats and mingle with each other and the staff. Webster participated in a similar event honoring the Marine Corps on Thursday, Nov. 10, at its newest NCR location, Henderson Hall in Arlington, Virginia, which will officially open for the Spring 1 term. Earlier this month, Webster University was named to the 2017 "Best for Vets" colleges ranking by Military Times for the fifth consecutive year. For over 40 years the University has partnered with the Department of Defense to offer high-quality education to service personnel and families. For more information on Webster University offerings and services for military veterans and families, visit the Office of Military Affairs.